Who wouldn’t want fuller thicker eyelashes? In today’s world, anything is possible yet sometimes we get blindsided by adverts rather than looking at the facts. Today we will be looking at a product that claims to provide you with fuller thicker lashes in just a matter of weeks. This product claims to be an innovative eyelash serum that is formulated to increase the length of your lashes by up to 78%. In addition to that, the product is also said to increase the thickness of your lashes by up to 83%. The manufacturer claims that the product works by promoting hydration, stimulating the eyelash follicles and protecting the hairs from damage. 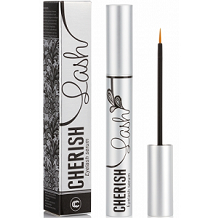 In this review of Cherish Lash, we will take a closer look at the facts to see if this serum lives up to its claims. The main ingredients in this formula such as aloe, and biotin are used to aid in hydration, enhancing elasticity and strengthening the hair, however, while this formula may look appealing at first glance, we noticed that it does contain Prostaglandins such as Methylamido Dihydro Noralfaprostal, this is a major concern. Prostaglandins do come with some harmful side effects and should not be taken lightly. Another concern is that this product does not contain any patented ingredients that have been clinically proven to encourage growth and lengthen the eyelashes. Cherish advises that you remove any makeup from your face first with a mild soap or cleansing agent. Contact lenses should also be removed before applying the product. A thin line of the product should be brushed onto the dried eyelashes above the level of the skin. One brush stroke should be sufficient enough to cover the eyelashes. The claim is that you should start to see results within 2 weeks, after 16 weeks of continued usage, your lashes should be noticeably longer and thicker. A wand of Cherish Lash retails for about $71.57 and can be purchased directly from the manufacturer. The manufacturer does not disclose how much product you get per tube which is quite concerning seeing as the price is fairly expensive. There doesn’t seem to be any discounts offered to consumers or promo codes which can be used. Since the product has to be used continuously for 16 weeks, it would be beneficial to the consumer if there was an option to buy bulk purchase deals, which is not the case here. There does not seem to be any guarantee policy in place for this product. After searching the site we were unable to find anything that mentions returns for the product line. Manufacturers who are confident in their formulas offer a strong money back guarantee that is visible on the product page, users should not have to search for the fine print to read the policy either. This is a major concern as the product is quite expensive and for a product in that price range, one would expect a guarantee to fall back on in case the product does not deliver on its claims. We appreciate the fact that this manufacturer has taken the time and efforts to create a user-friendly site and a formula that is animal cruelty-free, we also like the fact that the product is easy to use, however, we do have some concerns. Our first concern is that this formula is lacking vital patented ingredients that have been clinically proven to deliver measurable results. We also feel that the price point is extremely high and does not suit everyone’s pocket especially since there are no discounts or bulk purchase deals offered to consumers. Another major concern is that this product does not come with any guarantee meaning that if you pay the price of $71.57, and find that this product does not deliver on its promises, you are unable to get your money back. Based on our findings, we do not feel this is a groundbreaking formula and feel there are high quality and less expensive options available which have been proven to work.